The Belgian civil court system is modelled after the French (Napoleonic) three-tier system, in which a judgment handed down by the lower court may be appealed to a higher court with respect both to questions of law and to questions of fact, and the higher court’s decision is subject to limited review by the Supreme Court. 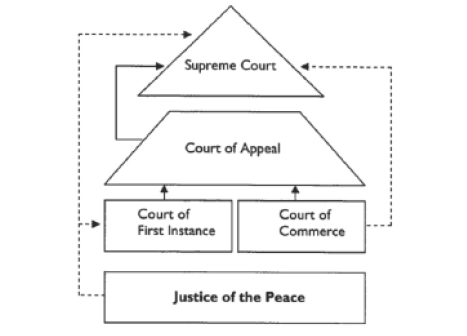 This diagram does not include the criminal, labour and administrative courts or the constitutional court. There are 187 justices of the peace in Belgium. As a rule, the justice of the peace has subject matter jurisdiction on all disputes where the amount of the claim is not in excess of €2,500, with the exception of a few disputes that are expressly reserved by law to other courts. In addition, the justice of the peace has special subject matter jurisdiction, regardless of the amount of the claim, on disputes regarding certain matters, such as disputes with regard to leases, certain family disputes and certain consumer credits. There are 13 courts of first instance in Belgium. A court of first instance has general jurisdiction on all disputes where the value of the claim is in excess of €2,500. There are a few exceptions to the general subject matter jurisdiction of a court of first instance; some matters are expressly reserved by law to other courts. claims regarding the application of tax laws. Claims regarding attachments, garnishment orders, etc, are handled by a specific chamber within a court of first instance: the ‘court of attachments’. Finally, a court of first instance has appellate jurisdiction with respect to judgments handed down by the justices of the peace established in the court’s district, provided the value of the claim is in excess of €1,860. Since 1 January 2016 (entry into force of the main provisions of the law of 19 October 2015 reforming certain features of the Belgian civil procedure), cases before a court of first instance are handled by chambers composed of one judge. Chambers may exceptionally be composed of three judges if the complexity or interest of the case as well as specific circumstances so require. Some courts of first instance or of the enterprise (for example, in Brussels or Antwerp) usually set up chambers that specialise in specific matters (construction, contracts, property, bankruptcy, etc). Three-judge chambers remain the norm before the labour courts and courts of the enterprise in which two lay judges sit with a professional judge. There are nine courts of the enterprise in Belgium. Under the Belgian Judicial Code, a court of the enterprise has jurisdiction on all disputes between enterprises (irrespective of the value of the claim), being any person or legal entity pursuing an economic objective on a lasting basis, provided the dispute concerns an act that was carried out in the pursuit of this objective, but except when the dispute belongs to the exclusive jurisdiction of other courts. In addition, a court of the enterprise has special or exclusive jurisdiction on a wide variety of disputes, including but not limited to disputes regarding corporations (including disputes between shareholders), claims involving insolvency proceedings, and claims in relation to inland and sea shipping. A court of the enterprise also has exclusive jurisdiction on all disputes between enterprises regarding intellectual property - namely, patents, trademarks and designs, etc. There are a few exceptions to these rules. Cases before a court of the enterprise are handled by chambers composed of three judges: one professional judge and two lay judges (usually entrepreneurs or bank employees that spend one or two days each month sitting as judges). There are five courts of appeal in Belgium, one each in Brussels, Antwerp, Ghent, Liège and Mons. All judgments handed down by a court of first instance or a court of the enterprise can be appealed before a court of appeal, provided the value of the claim is in excess of €2,500. However, there is no second appeal of a decision handed down by a court of first instance on an appeal from the justice of the peace. A court of appeal also has jurisdiction to certify certain decisions with respect to the utilities market or decisions of bondholders or shareholders in public limited companies. Since January 2017, chambers specialising in regulated markets (Markets Court) have been created at the court of appeal of Brussels. The Markets Court consists of judges having at least 15 years of professional experience evidencing of a specific knowledge of economic and financial law or regulated markets. The jurisdiction of the Markets Court covers the whole country. The Supreme Court reviews judgments handed down by the lower courts, provided all appeals have been exhausted. Thus, it reviews judgments against which no appeal can be lodged (namely, when the value of the judgment is less than €1,860 before the justice of the peace, or €2,500 before a court of the enterprise or a court of first instance) and judgments handed down in appeal from the justice of the peace by a court of first instance, as well as judgments handed down by the courts of appeal. In civil and commercial matters, appeals to the Supreme Court must be filed by one of the 20 lawyers admitted to practise at the Supreme Court. The Supreme Court does not review the facts of the dispute, but only whether the lower court has properly interpreted the law (including treaties and binding supranational regulations and laws), and whether it has complied with formal and procedural rules. As Belgian law provides that judgments must be reasoned and must respond to the parties’ arguments and exhibits, the Supreme Court’s review will extend to ensuring that the lower court’s findings of facts are consistent and not contradictory. In effect, this review entails a limited review of the facts by the Supreme Court. The Supreme Court does not actually settle the dispute but merely confirms the judgment under review, or strikes it down and remands the dispute to another court at the same level of jurisdiction as the court whose judgment was cancelled. Following a legal amendment that entered into force on 3 August 2017, when the Supreme Court decides to strike down a lower court’s decision, it now has a discretionary power not to remand the dispute to another lower court. The Supreme Court should use this power when it finds that there is nothing further to be decided in the dispute. Moreover, if the Supreme Court decides to remand the dispute to a lower court, the latter is now bound to comply with the Supreme Court’s decision. The Constitutional Court has a dual function: it rules on conflicts between the federal laws and the regional laws; and it rules on the compatibility of these laws with the main provisions of the constitution or of international instruments, including particularly the provisions that guarantee civil liberties and rights. Two types of claims can be submitted to the Constitutional Court. An annulment claim can be filed against the laws passed by the federal, regional or community legislatures, within six months from the date of publication of the law in the Official Gazette or of a decision of the Constitutional Court on a preliminary question stating a violation of the above-mentioned rules. The annulment claim can be filed by the Council of Ministers and the governments of the regions and communities, by the chairpersons of all legislative assemblies, or by any natural or legal person who can show that it has a justifiable interest in pursuing the annulment of the law, namely that it will be affected personally by the law in question. Courts may also (sua sponte or upon the motion of one of the parties) refer a preliminary question to the Constitutional Court when they are in doubt as to the compatibility of a law with the above-mentioned rules. Claims against the government and certain administrative bodies regarding the validity of certain decisions or actions taken by the administration (eg, a decision denying an export licence, or adjudicating a public procurement) are subject to the jurisdiction of the Council of State. The Council of State has the authority to suspend and eventually annul the disputed decisions and actions. These claims are brought forth before the Council of State, in accordance with the procedural rules set out in the Laws on the Council of State of 12 January 1973, amended by the Laws of 6 and 19 January 2014. The Council of State may award a compensation to indemnify the harm suffered because of the annulled decision or action. Compensation must also be sought from the civil courts. Once compensation has been claimed before one instance, it is not possible to bring a claim for compensation before another one. The role of the judge is to adjudicate the dispute by applying the law to the claims, facts and evidence that are submitted by the parties. A judge may not rule on matters not claimed by the parties (judgment extra petita), or award more than what was claimed by the parties (judgment ultra petita). He or she must decide on every claim brought forward by the parties. The procedure is adversarial (except in certain circumstances - see questions 5 and 12). Each party must submit the evidence on which it bases its claim. Judges supervise the admissibility, relevance and weight of the evidence submitted by the parties. A judge may, upon a party’s request or ex officio, order an inquiry, a witness deposition or the submission of certain documents. He or she may also appoint experts or issue a request to another (foreign) court in respect of the same measures. Pursuant to the maxim da mihi factum, dabo tibi ius (‘give me the facts, and I [the judge] will give you the law’), the parties need only (in theory) to submit the facts and evidence of their claims to the judge, who must identify and apply the law to decide the case. This obligation has been reaffirmed several times by the Supreme Court, including with respect to foreign law. Although in theory the parties have no obligation to argue or prove the law on which they rely, practice shows that legal argument and discussing the law or the foreign law before the judge are an essential part of the lawyer’s role. Finally, a judge is the guardian of public policy. He or she must ensure that relevant provisions of public policy are not violated and may not entertain claims or remedies that would be against public policy. There are no jury trials in civil proceedings in Belgium. Judicial training: a candidate who has held a position in the legal sector for at least one year during the past three years is entitled to take part in the qualification process for judicial training. After three years of judicial training, the candidate can be appointed as a judge. Examination of professional competence: more experienced lawyers can be appointed as a judge immediately (without judicial training) but have to pass written and oral exams. Oral examination: a candidate who has worked as an attorney for at least 20 years or for 15 years as an attorney and at least five years as an in-house lawyer is entitled to be appointed immediately on the basis of an oral examination (without having to pass a written exam). Depending on the vacant positions, the Superior Council of Justice selects candidates who have fulfilled the conditions set out above. The selection is based on objective criteria related to the candidates’ abilities and capacities. Under Belgian law, terms of limitation are a matter of substantive, not procedural, law. They will therefore be determined by reference to the substantive law applicable to the dispute, as shall be designated by the court’s conflict of laws rules. most other claims are time-barred after 10 years (eg, the term of limitation to enforce a judgment is 10 years). There are many exceptions to these general terms of limitation in respect of property leases, compensation for the termination of commercial agency agreements, professional fees, etc. Finally, the above terms of limitations can be renewed by serving a writ of summons, notice of a payment request or attachment, if the plaintiff acknowledges the debt, or if the creditor’s lawyer, bailiff or representative sends a letter of formal notice to the debtor located in Belgium provided this letter meets certain legal requirements. With a few exceptions (such as in disputes regarding residential lease and land lease agreements), Belgian law does not require any action to be taken before legal proceedings are initiated. If the parties have agreed on mediation or on another form of pretrial ADR, the court shall stay the proceedings, at the defendant’s request, until the ADR method has had a chance to succeed. The defendant domiciled in Belgium may require the foreign plaintiff to post a guarantee, covering the costs of the proceedings and of service, before the court hears the claim (cautio iudicatum solvi). This does not apply if the claimant is domiciled in the European Union or in a state that has concluded a treaty with Belgium exempting claimants from this obligation. In most cases, a process server will serve summons on the defendant, either by delivering a writ of service to the defendant’s address or through other methods of service available under international conventions. After service has occurred, the claim will be recorded in the court’s registry. In certain cases, the summons can be filed by the claimant with the court rather than served; the court will then send notice to the defendant by registered mail. The defendant is notified of the commencement of proceedings when he or she receives the notification of the court by registered mail. The defendant is deemed to have received this notification on the day following the one when the notification was brought to his or her domicile, residence or address for service. The summons must comply with strict requirements regarding the identification of the parties to the dispute, the factual background of the dispute, the claim and the relief sought, the court seised, and the date, time and place of the introductory hearing. Parties are allowed to raise new arguments during the exchange of briefs. However, under Belgian law, a ‘new claim’ (ie, an application aiming at extending or modifying the scope of the initial application) must be based at least in part on statements or facts contained in the initial writ of summons. There is a minimum waiting period of eight days between the date of service and the date of the introductory hearing in court. When the defendant is a foreign resident, the period of notice is extended by an additional 15 days for countries with which Belgium shares a border and for the United Kingdom, 30 days for other countries in Europe and 80 days for the rest of the world. In urgent cases, an application may be lodged with the court for an ex parte order, shortening the waiting period. A third way of introducing a claim is by an ex parte application filed with the court. In this case, the defendant is not notified or served, and is not made aware of the commencement of proceedings. A claim can only be lodged ex parte if the law expressly provides so (such as in proceedings for the enforcement of arbitral awards or foreign judgments or applications for authorisation to attach assets). A claim for temporary measures can also be initiated by an ex parte application when exceptional circumstances warrant this, such as extreme urgency, the need to take the defendant by surprise or the impossibility of identifying the adverse party (such as in cases of strikes). Finally, the parties may also file a joint application to the court and request the court to settle their dispute. Some of the Belgian courts, particularly the courts of appeal, have a backlog of cases, which can delay the adjudication of a dispute for several years. Recent amendments to the Belgian Judicial Code, together with the appointment of more judges and court assistants, have led to improvements. The Belgian Judicial Code also allows for expedited procedures in a series of cases. a list of cases in which the parties are ready to plead is set up so as to allow for hearings to be scheduled at short notice. the judgment rendered by the court. The claim is usually not heard at the introductory hearing, but postponed in order for the parties to exchange briefs. Simple claims, uncontested claims, interim measures such as the appointment of experts (see question 12), language issues (see question 36), challenges to the court’s jurisdiction and a few other matters may be heard at the introductory hearing. Upon the introductory hearing, the court or the parties (see question 7) must set a procedural timetable that determines both the deadlines for filing the parties’ briefs and the date of the oral hearing. Parties may, however, ask jointly for the postponing of the case for an indefinite period. The power of initiative rests mainly with the parties, particularly with the claimant. The courts will not take any initiative and will act only if a party has requested it to do so. The parties may agree on the timetable for exchanging briefs and on postponing the oral hearing. The courts will determine ex officio the calendar when the parties do not reach an agreement on it. If a new and relevant fact is discovered by a party after the deadlines for exchanging briefs, the judge may, at that party’s request, grant new deadlines and, if necessary, a new date for the oral hearing. When the parties do not agree on other procedural matters, the courts will step in, at the request of one of the parties, and issue procedural orders. New provisions have been inserted in the Belgian Judicial Code to allow for the electronic management of cases. However, these provisions are not fully effective yet due to a lack of technical means. So far, it is possible to file written submissions by electronic means with the registries of the courts of appeal, the courts of the enterprise and some justices of the peace. The system is also currently being tested before some courts of first instance (Antwerp, Ghent, Liège and Namur). The Belgian Judicial Code does not impose a general duty to preserve documents and other evidence pending trial. However, such obligation may result from other laws. Thus, tax and accounting laws impose an obligation to keep records and accounts for a number of years. Further, there is no general obligation to share evidence with the other parties. There is no discovery process under Belgian law. However, if there is reason to believe that a party or a third party holds a document that is likely to prove a fact that is relevant to the dispute, the court may order that party or third party to submit it. If the party or third party in question refuses to produce the document without a valid reason (eg, the document is privileged), it can be ordered to pay a non-compliance penalty. In addition, the court may, depending on the circumstances at hand, infer from a party’s refusal to submit certain documents that the disputed fact is proven or such other inference as the court shall deem reasonable. Communications between lawyers who are members of a bar and their clients, medical records and some other documents are considered privileged and will not be allowed as evidence by the courts. Disclosing such documents or information may even, depending on circumstances, constitute an offence criminally prosecuted. Some communications between in-house lawyers and their clients will also be deemed privileged. Documents exchanged between external lawyers and their clients are covered by professional secrecy as protected by the Belgian Criminal Code. Belgian courts have, until now, been very protective of professional secrecy and allowed few exceptions. For example, the Belgian Constitutional Court has partly cancelled a law regarding money laundering that imposed an obligation on lawyers to blow the whistle on their clients in certain transactions. Communications between external lawyers are confidential, pursuant to rules of conduct adopted by the Bar Councils. As a rule, any written correspondence between opposing lawyers in their capacity as counsel to a party is confidential, with limited exceptions. As far as cross-border communications with European external lawyers is concerned, the Code of Conduct for European Lawyers of the Council of Bars and Law Societies of Europe guarantees confidentiality only in the event that the lawyer who intends to send a confidential letter to a lawyer in another member state clearly expresses this intention before sending the letter in question and the recipient does not immediately protest such announcement. With regard to cross-border communications with other external lawyers, extreme caution is recommended. The Belgian Act of 1 March 2000 establishing the Institute of In-House Lawyers preserves the confidentiality of legal advice given by an in-house lawyer for the benefit of his or her employer and in his or her capacity as legal adviser. The protection granted by this provision is narrower than that which applies to communications between a lawyer and his or her client. The statute only covers legal advice, thereby excluding (draft) agreements, minutes of meetings, correspondence with other companies, communications that only contain information, etc. The confidentiality rule also does not cover communications with persons other than the employer or the company’s external lawyers. Neither does it apply when the letter sent to the employer is also sent to other persons and third parties. Therefore, correspondence with the lawyer of the adversary party is not confidential. However, a convention was signed in 2006 between the Belgian Institute of In-House Lawyers and the Belgian French- and German-Speaking Bar Association, which considers as confidential communications and negotiations between an in-house lawyer and an external lawyer from the bar mentioned above. Confidentiality is safeguarded in both civil and criminal procedures, as well as towards other authorities, such as the social or environmental inspection, and tax authorities. The protection also stands before Belgian competition authorities. However, the European Court of Justice decided, in the 1982 AM&S case, that the legal privilege of in-house lawyers does not stand towards European competition authorities. In 2010, in the Akzo case, the European Court of Justice confirmed this position and decided that the privileged character of communications between a lawyer and his or her client did not extend to the communications between a firm and its in-house lawyers. There is no pretrial discovery process in Belgium. Witness statements and expert reports will be exchanged during trial and submitted together with the parties’ respective briefs (see question 6). 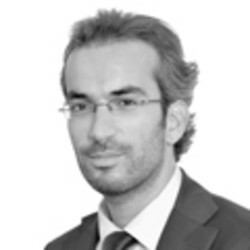 Belgian civil procedure is accusatorial in nature: since the courts have a rather passive role, it is up to each party to prove the facts on which it bases its claim or defence. While parties rarely rely on witnesses, this is allowed under Belgian law. The parties may file witness statements (affidavits), and courts may order witness statements to be filed ex officio. Since August 2012, witness statements are subject to specific substantive and formal requirements. The parties may request the court to order the deposition of a witness. The court may also order the deposition ex officio. This can take place either in court or at another location, depending on circumstances. If a witness refuses to appear voluntarily, the court may summon the witness to appear, subject to a non-compliance penalty and damages. A judge will be designated by the court to administer the oath to the witness and take the deposition. As a matter of principle, the judge alone may interrogate the witness. If the parties are present, they may not confront the witness directly and must submit their questions to the judge, who decides whether to ask the question to the witness. Courts are usually flexible and will allow direct follow-up or clarification questions. The court may, at a party’s request or ex officio, order an expert investigation. It will then appoint an expert who will meet with the parties, carry out an expert investigation and submit a draft report on his or her findings to the parties. The parties will be allowed to comment on the draft report before the expert files the final report. The court is not bound by the expert’s findings. The court may decide to hear the expert, order additional investigations, ask questions to the expert or appoint other experts. The parties may file their own expert reports and request the court to hear their expert. In this case, the procedure for witness depositions applies. A claim can be brought before the presiding chair of a court to obtain urgent relief in summary proceedings. Such relief is temporary and does not bind the court that will hear the full case on its merits. the relief sought must only be of a temporary nature. claims for the appointment of an interim manager or auditor to supervise the management of a company. When there are compelling reasons to avoid an adversarial discussion - for instance, because of the extreme urgency of the situation at hand or because of the need to take the adverse party by surprise - these measures can even be obtained ex parte. before the presiding chair of a court of the enterprise under the Company Code regarding claims for the exclusion of shareholders or the forced buyout of shares. Attachment or garnishment measures are available as a pretrial remedy, if the claimant can show that he or she has a prima facie claim against the debtor and there is a risk that the debtor may become insolvent or try to avoid payment. Pursuant to the Act of 28 April 1999 implementing the EU Directive 98/26/EC of 19 May 1998 on settlement in payment and securities settlement system, the funds, securities or securities entitlement of foreign states or instrumentalities held in the Euroclear system (or in other similar international clearing systems) may not be attached. Article 1412bis of the Belgian Judicial Code prevents attachments of the assets of the Belgian state and public entities. These assets are not immune if the concerned entity declares that they can be subject to attachment or if they are not necessary for the fulfilment of governmental purposes. Article 1412ter of the Belgian Judicial Code prevents attachments of all cultural assets belonging to a foreign entity when such assets are present in the Belgian territory for the purpose of a public and temporary exhibition. Article 1412quater of the Belgian Judicial Code provides that any assets that foreign central banks or monetary institutions own or manage in Belgium are immune from attachment. However, these assets are not immune if they are exclusively allocated to an economic or commercial private law activity. The creditor seeking to attach these assets must demonstrate that they are not immune by filing an ex parte application for authorisation before the court of attachments prior to any attachment. it is established that the assets are specifically in use or intended for use by the foreign state or organisation for other than non-commercial governmental purposes and are located in the Belgian territory, with the provisio that only the assets related to the entity referred to in the enforceable title or authentic or private document underlying the attachment can be attached. further, a Belgian court may also grant compensatory damages. Belgian law allows for the compensation of actual losses (both economic losses and moral distress) and consequential damages, provided causation can be established. However, a Belgian court cannot order the payment of punitive damages. Since 1 January 2016, unless provided otherwise by law or decided otherwise by judges, judgments from lower courts are immediately enforceable notwithstanding the initiation of an appeal. Likewise, judgments handed down by the presiding chair of a court are enforceable immediately. Depending on the remedy awarded in the judgment, enforcement will usually be carried out by a process server, who will collect payment from the judgment debtor by attaching and selling the debtor’s property and assets, or by garnishment of the debtor’s receivables and bank accounts; and, in respect of orders for specific performance, serve the order and collect the non-compliance penalties. The judgment creditor may also force the judgment debtor into bankruptcy. In accordance with the Belgian constitution, court hearings, records and judgments are in principle public (the access to hearings and judgments can be restricted in special circumstances). Publicity does not apply to inquiry measures, such as witness testimony or judicial expertise. Exceptionally, the law, or the court itself, may depart from the rule of publicity in the interest of public order, the rights of minors or the right to privacy. Even in those cases, the judgment itself remains public. The availability of court documents has long been disputed: some argue that all court documents are available to any interested party and that the court registry must provide a copy upon simple request; others maintain that access to court documents can only be granted with the prior approval of the attorney general. In comparison with most countries in Europe, the cost of civil litigation in Belgium is rather reasonable. Apart from a moderate ‘procedural indemnity’ (see below), and apart from when a court determines that a party’s conduct is extremely frivolous or vexatious, there is no fee shifting in Belgium. The amount of the ‘procedural indemnity’ is set by law. This amount is adjusted from time to time for inflation. Since 1 June 2016, the amount of the procedural indemnity is calculated as follows: if the claim cannot be appraised in monetary terms, the basic amount of this indemnity is €1,440. In respect of claims that can be appraised in monetary terms, the basic indemnity will range from €180 to €18,000. In certain circumstances, the amounts set by the law may be increased (to a maximum of €36,000) or decreased by the court. These amounts must be paid by the losing party to each adverse (winning) party for each instance (lower court, higher court). However, if one party loses against several adverse (winning) parties, the procedural indemnity that the losing party will be ordered to pay cannot exceed twice the maximum amount that is claimed by the (winning) adverse party that may claim the highest indemnity. The procedural indemnity is not applicable to proceedings brought before the Supreme Court. The costs of filing and registration with the court registry are fixed and depend on the nature of the writ that is filed with the court registry and on the amount of the claim. Moreover, the filing costs are collected ‘per claimant’. This undoubtedly has an impact on the initiation of class actions in Belgium (see question 19). Belgian law and rules of ethics require lawyers to charge fees with moderation and fairness. In practice, bar regulators require the fees to be reasonable and transparent, and proportionate to the difficulty of the case and to the stakes of the dispute. Strict ‘no win, no pay’ contingency fees are not allowed. However, a lawyer may charge a reasonable success fee to his or her client, if the outcome of the case warrants this. Third-party funding is allowed. The third party and the claimant may agree on sharing the proceeds of the dispute. However, short of assigning the claim, this does not give the funding third party standing to take part in the proceedings. Extreme caution must be exercised when drafting the funding agreement, and even more so the assignment agreement, as Belgian law allows the debtor of disputed claims to redeem the debt by paying back to the assignee the price paid for the assignment, with interest and costs. Insurance for legal costs has long been available in Belgium, as part of or as an optional addition to automobile liability insurance. The government has adopted measures to encourage the development of legal costs insurance policies in other sectors. Actions for collective redress (class actions): under the influence of the European Commission recommendation on common legal principles on collective redress dated 11 June 2013 and of legislative initiatives in some neighbouring European countries, a Belgian Act regarding class action proceedings was passed on 28 March 2014. The Act was introduced in Book XVII, Title 2 of the Belgian Code of Economic Law and came into force on 1 September 2014. The need was clearly felt both to ensure access to court in those situations where the circumstances discourage an individual to act on his or her own, and to ease and enhance the efficient settlement of multiparty disputes. The scope of this Act is very limited: only groups of consumers represented by non-profit organisations or public bodies are allowed to bring a class action suit and this suit must be addressed against an ‘enterprise’ (as defined in question 1) in case of an alleged violation of specifically enumerated Belgian and European rules (insurance; banking and finance; energy; passenger transport; etc). On 6 June 2017, the scope of the class action regime was extended to infringements of EU competition law (articles 101 and 102 TFEU including the ban on cartels and abuses of dominant positions). The Brussels Court of First Instance and the Brussels Court of the Enterprise have an exclusive jurisdiction to rule on class actions. Since the entry into force of the Act in September 2014, six class actions have been introduced before Belgian courts. All these actions have been brought by Test-Achats/Test-Aankoop, the main Belgian consumer protection organisation. The first class action was initiated to obtain compensation from the National Railway Company of Belgium (NMBS/SNCB) for the interruption and the suspension of the train service during eight days of national strikes in 2014 and 2015. No decision was handed down in that case since the parties reached an amicable settlement before the hearings on the admissibility of the class action. The second class action has been brought against the commercial airline company Thomas Cook following the delay of a flight. On 4 April 2016, that action was found admissible by the Brussels Court of First Instance. The court decided to apply the opt-in system (ie, only the consumers that have suffered the collective harm and have expressly notified the court’s registry of their intention to be part of the group within six weeks will belong to the group). The third class action was brought against the Volkswagen Group within the context of ‘Dieselgate’. The fourth action was initiated against the Belgian telecommunications company, Proximus, after it introduced a renting formula for its new decoders. The most recent class actions were brought against eight websites involved in the resale of concert tickets at high prices and against Groupon Belgium.In 2014, the Belgian government stated that class actions as provided in the Act of 28 March 2014 will be assessed two years after its enactment. At the end of 2016, the Belgian Federal Public Service Economy sent a questionnaire to stakeholders about the admissibility requirements, composition of the group, conduct of the proceedings, procedural costs and funding, etc. The Belgian government has then assessed class action proceedings on the basis of the results of the questionnaire. On that basis, on 1 September 2017, the Belgian Council of Ministers approved a preliminary draft bill extending the access to class actions to small and medium-sized enterprises (SMEs). Further to some amendments, the draft bill was adopted by the competent committee of the Chamber of Representatives on 6 March 2018 and is soon to be put to vote in plenary session. Actions of collective interest: in certain cases, the law allows some form of representative action, where consumer or professional organisations may seek injunctive relief against practices that harm the interests of consumers or of the members of the organisation. Cases arise frequently in respect of advertising for consumer goods, consumer safety or securities offerings. These organisations cannot recover damages for their members. They may, however, seek damages for themselves, to the extent that the practice in question harms their own personal interests. Similar remedies exist in environmental law. In addition, workers’ unions and qualified human rights organisations are allowed to seek injunctive relief against practices that violate certain labour rights or non-discrimination laws. Collective (related) actions: several individual legal actions arising from a similar event or the same contract can be joined and consolidated in the same proceedings by different claimants who are often represented by the same lawyer. This happens, for instance, in major securities fraud or negligence cases. The related actions are handled by the court jointly even if they remain, from a legal perspective, individual actions. Any judgment can be appealed, both on the findings of fact and on the findings of law. The court of appeals hears the dispute de novo. The main exception is when the lower court adjudicates a claim that is for less than €1,860 (justice of the peace) or €2,500 (first instance and enterprise). Judgments handed down by lower courts are, in principle, immediately enforceable unless provided otherwise by law or decided otherwise by judges (see question 14). It means that an appeal does not stay the enforcement of judgments rendered by lower courts. There is a right of further appeal (or immediate appeal if the judgment does not meet the thresholds for a first appeal) to the Supreme Court (see question 1). Appeal to the Supreme Court is limited to questions of law and formal requirements. Judgments rendered in a member state of the European Union resulting from proceedings initiated as from 10 January 2015 will be recognised and enforced in Belgium in accordance with the provisions of Council Regulation (EU) No. 1215/2012 of 12 December 2012 on jurisdiction and the recognition and enforcement of judgments in civil and commercial matters (Brussels Ibis). The EU Regulation No. 44/2001 of 20 December 2000 (Brussels I) still rules the recognition and enforcement in Belgium of judgments resulting from proceedings initiated before 10 January 2015. The EU Regulation No. 1215/2012 provides that a judgment given in a member state that is enforceable in that member state shall be enforceable in other member states without any declaration of enforceability being required (assimilation). The grounds for denying enforcement under Regulation Brussels Ibis are the same as the grounds for denying recognition and enforcement under Regulation Brussels I, that is where there is a violation of due process and where (recognition or) enforcement would be manifestly contrary to public policy, when the foreign judgment is irreconcilable with a judgment given in a dispute between the same parties, and when the foreign judgment infringes rules on mandatory jurisdiction (insurance, consumer contracts and employment contracts) and exclusive jurisdiction. Furthermore, Regulation Brussels Ibis expressly introduced the possibility to file a claim to obtain a declaration of unenforceability of a foreign judgment. The Council Decision 2007/712/EC applies to the recognition and the enforcement of judgments rendered in member states of the European Free Trade Association. No security, bond or deposit may be required of a party that applies for enforcement of a judgment given on the ground that he or she is a foreign national or that he or she is not resident in Belgium. The recognition and enforcement of foreign judgments rendered in countries with which Belgium has not concluded a treaty are governed by the Belgian Code of Private International Law. the foreign court had jurisdiction solely because the defendant was present or had assets in the foreign jurisdiction, without any relation between that presence or assets and the claim. Under the EU Regulation Brussels Ibis, the creditor must not obtain judicial leave to enforce a foreign judgment in Belgium. He or she shall immediately enforce it in Belgium with the assistance of a bailiff, provided the creditor provides him or her with an authenticated copy of the judgment and a certificate issued by the member state of origin. The certificate must be served on the debtor before laying any measure of enforcement. The bailiff or the served debtor may ask for a translation of the judgment. The debtor may challenge the enforcement measures by filing an application to obtain a declaration of unenforceability before the competent court of first instance. An appeal can be lodged with the court of appeal against the decision rendered by the court of first instance. If the EU Regulation Brussels I is still applicable or if the judgment is handed down in a country with which Belgium does not have a treaty, the procedure for obtaining leave to enforce the foreign judgment in Belgium is reasonably fast. The application is filed ex parte before the court of first instance of the district where the defendant is domiciled or has his or her residence, or the place where enforcement will probably be sought. According to Belgian law, even if a foreign judgment has not yet been declared enforceable in Belgium, it is sufficient to provisionally attach assets located in Belgium while the enforcement procedure is pending. in addition, the courts may - and generally do - require a translation of the judgment if it is written in a language other than the court’s language. The court will review the application summarily and make a formal check of the documents accompanying the application. The order handed down in ex parte proceedings can be challenged by the judgment debtor before the same court within a period of one month from the date of service of the enforcement order. Although this suspends the enforcement of the foreign judgment, the judgment defendant’s assets may be attached or his or her accounts garnished, as a guarantee for the enforcement of the judgment. If the court has denied the enforcement order sought by the judgment creditor or has rejected the judgment debtor’s challenge of the enforcement order, the defeated party may file an appeal before the court of appeal. However, in the case of enforcement under Regulation Brussels I, the debtor may only lodge an appeal against the enforcement order before the Supreme Court. Regarding evidence to be taken either in Belgium in support of proceedings in another EU country, or in another country of the EU in support of litigation in Belgium, the rules are set by Council Regulation EC 1206/2001 of 28 May 2001 on cooperation between the member states in the taking of evidence in civil and commercial matters. The Regulation seeks to streamline cooperation in the gathering of evidence abroad in the relations between the member states of the European Union. The aim of the Regulation is to simplify and speed up the transmission and execution of requests for obtaining evidence through techniques such as the deposition of witnesses and the inspection of documents or objects. According to the Regulation, the requesting court must directly address its request to the courts in the country where the evidence must be obtained and that have jurisdiction over the witness to be heard or the person holding the requested document. The requested courts then have 90 days to process the request. Parties and representatives of the requesting court have the right to be present during the taking of evidence by the requested court if the law of the requesting court allows such presence. A requesting court may also be authorised to directly proceed to the taking of evidence in the other country if this can be done on a voluntary basis without the need for coercive measures. In respect of evidence located in states that are not bound by Council Regulation EC 1206/2001, Belgium applies the Hague Convention of 1 March 1954 on civil procedure. Belgium has also concluded a number of bilateral treaties on civil procedure and judicial cooperation. Most of these treaties were concluded with European Union member states (inter alia, France and Germany) and have become moot as a result of the adoption of EC Regulation 1206/2001. In respect of those states with which Belgium does not have a treaty, the Belgian Judicial Code operates as a fallback mechanism, and Belgium will enforce letters of request issued by foreign courts and transmitted by foreign governments, pursuant to the relevant provisions of the Belgian Judicial Code. The procedure, however, is very time-consuming, and therefore often inadequate for obtaining evidence in the context of proceedings pending abroad. Foreign parties may also apply to the Belgian courts directly (rather than through a letter of request sent by the foreign court to the Belgian court), under the provisions of the Belgian Judicial Code, for obtaining evidence in Belgium. Briefly, the following measures can be sought: deposing witnesses; obtaining the production of documents (see question 8); and obtaining the designation of a court-appointed expert. In urgent cases, these measures can be obtained in summary proceedings before the chairperson of a court of the enterprise, a court of first instance or a labour court (see question 12). Yes, since the entry into force on 1 September 2013 of the new law on arbitration of 24 June 2013, which amended the sixth part of the Belgian Judicial Code. The ‘new’ Belgian regime is to a large extent inspired by the UNCITRAL Model Law. The Belgian regime, however, keeps certain specificities, for example, on the grounds for annulment (see question 31) and the absence of ex parte interim measures ordered by the arbitral tribunal. The ‘new’ rules apply to arbitral proceedings that commenced after their entry into force on 1 September 2013. In 2016 (by an Act of 25 December 2016), some minor changes and corrections of the law on arbitration of 24 June 2013 were implemented. These amendments pertain mostly to the arbitration procedure and not to the recognition and enforcement of arbitral awards. They entered into force on 9 January 2017. 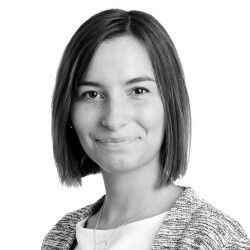 Pursuant to the new provisions on arbitration in the Belgian Judicial Code, an arbitration agreement is not necessarily a written document, and can even be oral as long as it can be proved by all means of law. Any document, including emails, letters, faxes and contracts, may contain an arbitration agreement, as long as it clearly expresses the parties’ intention to submit their disputes to arbitration. In the absence of such document, other elements, such as the acknowledgment of the arbitration agreement by a party or the voluntary appearance before the arbitral tribunal, may constitute evidence of the existence of the arbitration agreement. Whether a party can invoke an arbitration clause inserted in its general terms and conditions depends on the general law of obligations applicable pursuant to Belgian conflict of law rules, in particular, the rules pertaining to the enforceability of such terms and conditions. Generally speaking, the formal requirements in civil matters are more severe than in commercial matters, where the mere reference to a document containing an arbitration clause may suffice if the defendant had or could have had knowledge thereof at the time of execution of the contract and accepted it, or raised no objection. When the parties have not agreed on the number of arbitrators, the arbitral tribunal will comprise three arbitrators. If the arbitration agreement is silent on the way the arbitral tribunal should be set up, the plaintiff must notify the defendant of its intention to resort to arbitration, state the name of the arbitrator of its choice and invite the defendant to appoint an arbitrator. If the defendant fails to appoint an arbitrator within one month as from the notification sent by the plaintiff, the latter can request the chairperson of a court of first instance to appoint the arbitrator. The same applies in the event the party-appointed arbitrators fail to reach agreement on who should chair the arbitral tribunal. This process can be time-consuming, especially if one of the parties refuses to participate in setting up the arbitral tribunal and undermines every effort to that end. It is therefore highly recommended that the parties either nominate the arbitrators in their arbitration agreement or, alternatively, leave the appointment of the arbitrators to the decision of a neutral appointing authority, such as an arbitration institution. An arbitrator can be challenged on the following grounds: he or she lacks the legal capacity to act as an arbitrator; he or she does not meet the requirements that have been set in the arbitration agreement; or circumstances exist that give rise to justifiable doubts as to his or her impartiality or independence. A party cannot challenge the appointment of an arbitrator on the basis of grounds of which he or she was aware when the appointment was made, unless he or she objected to the appointment at that time. The parties may also agree upon a procedure for challenging the appointment of arbitrators. Failing an agreement, the party that wishes to challenge the appointment of an arbitrator must first notify its objections to the concerned arbitrator, the other arbitrators (if any) and to the other party. The arbitrator then has 10 days to withdraw. If he or she does not do so, a motion can be filed before the chairperson of the competent court of first instance for an order dismissing the arbitrator. Parties have a wide margin of discretion regarding the appointment of arbitrators. They can either address the issue of the appointment of arbitrator(s) in their arbitration agreement or when the dispute arises. Belgian law does not require any specific qualifications in order to be appointed as an arbitrator. Parties are free to appoint the arbitrators of their choice (a lawyer or an expert in a specific area such as the building industry, for instance). The only requirement is that arbitrators must be independent and impartial at the time of their appointment and throughout the proceedings, and that the choice of arbitrator cannot be based on unfair discriminatory reasons. Parties usually refer to the rules of an arbitral institution in their arbitration agreement. CEPANI (the Belgian Centre for Arbitration and Mediation) is the most important arbitration institution in Belgium. It publishes on its website a list of members who have experience in arbitration and can be appointed as arbitrators. The Belgian Judicial Code sets out the procedural rules that will apply to the arbitration, provided, however, that the parties or arbitrators have not agreed otherwise (in the case of ad hoc arbitration), or provided that the arbitration institution does not itself dispose of a set of procedural rules (in the case of institutional arbitration). the enforcement of the arbitral award (see question 32). As indicated above, in principle these rules only apply by default and are thus not mandatory, with the exception of the provisions on the impartiality and independence of arbitrators, the adversarial nature of the procedure and the recourses against the award. The intervention of the chairperson of a court of first instance may be sought in respect of the appointment of the arbitrators (see question 25). A court of first instance can hear challenges of arbitrators (see question 25). While arbitral tribunals may order interim and conservatory measures (see question 29), the parties may also apply to the courts to obtain urgent interim relief (see question 12). Interim and conservatory measures are ordered on an ex parte basis. The application must be filed with the court of first instance of the place where the party against whom enforcement is sought has its domicile or residence in Belgium, or, in the absence of such domicile or residence, the place where the applicant wishes to enforce the award. The decision of the court shall not be subject to an appeal of any sort. When a witness refuses to be deposed before an arbitral tribunal, the deposition will be taken before a court of first instance. All claims that documents are forged or that signatures are not authentic may only be heard by a court of first instance. There is no supervision of the making or drafting of the arbitral award itself, but a court of first instance can assign a deadline to the arbitrator or arbitrators to deliver the award. The recognition and enforcement of an award are also sought before a judicial court. In accordance with the Belgian Judicial Code, the arbitral tribunal may order any such interim or conservatory measures it deems fit, except issuing attachment orders, as this comes under the exclusive jurisdiction of state courts. The arbitral tribunal’s authority to grant interim measures does not restrict the parties from seeking interim relief from the courts, if urgency so requires (see questions 12 and 28). Typical examples of interim relief granted by an arbitral tribunal are an order to submit documents or to depose witnesses, an order to provide security for costs, or the appointment of an expert to assist on technical issues or to assess damages. However, the arbitral tribunal has no authority to force reluctant witnesses to be deposed, or to decide claims that documents were forged or that signatures are not authentic. Another example of an interim measure is an order to hand over a disputed asset or document to a third party until the end of the arbitral proceedings, so as to safeguard it. In principle, the arbitral tribunal takes its decision by a simple majority, unless the parties have agreed otherwise. The parties may also agree that the chairperson’s vote is decisive in the event that the arbitrators fail to reach a majority. The arbitral award must be in writing and signed by the arbitrators. In the event that one or more of the arbitrators cannot or refuse to sign, this must be reported in the award itself. The award sets out the decision of the arbitral tribunal and the reasons on which the award is based. Furthermore, the award must state the names and domiciles of the arbitrators and of the parties, the subject matter of the dispute, the date of the award and the seat of the arbitration. If the arbitration is not organised under the auspices of an institution, the chairperson of the arbitral tribunal notifies every party by sending a duly signed copy of the arbitral award. Appeal proceedings are extremely rare in Belgium, where most awards are considered final and binding. Under Belgian law, it is impossible to file an appeal against an arbitral award before a court. In the rare cases where the parties provide for an appeal against the award in their arbitration agreement, the appeal will be lodged before an arbitral tribunal composed of different arbitrators. Unless the parties have agreed otherwise, the procedure (including the composition of the new arbitral tribunal) is similar to the procedure applied before the first arbitral tribunal (see question 27). Unless the arbitration agreement provides otherwise, the parties must file their appeal within one month of the date of service of the arbitral award (the new rules provide that the one-month period starts as from the date of notification of the award). Nonetheless, the original arbitral tribunal may decide that its award is provisionally enforceable notwithstanding appeal. When the arbitration agreement does not provide for an appeal, a party wishing to challenge an arbitral award may file an application for setting aside or challenging its recognition and enforcement. On 16 February 2017, the Belgian Constitutional Court found that third parties to arbitration proceedings should be entitled to file a third-party opposition against arbitral awards if these awards infringe their rights. The third-party opposition is a judicial remedy available to persons who were neither parties nor represented in the main proceedings but who suffer damage as a result of the decision handed down in those proceedings. So far, such a recourse was only possible against judicial court decisions and not against arbitral awards. In its decision, the Belgian Constitutional Court stated that court decisions and arbitral awards have the same effects towards third parties. 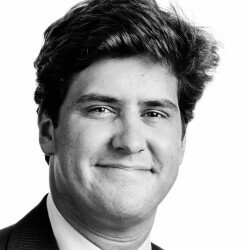 However, the Belgian lawmaker will have to define the legal regime of this new type of third-party opposition, which cannot be brought before the arbitral tribunal (as there is no arbitration clause binding the third party) but will have to be introduced by the third party before a judicial court. When the arbitral award has been rendered in Belgium, a party may seek the annulment of all or part of the award on one or a combination of the following grounds (pursuant to the new rules on arbitration, these grounds for annulment have become stricter - under the former regime additional grounds were available, which are not listed below). (ix) the award was obtained by fraud. The grounds mentioned under (i), (ii), (iii) and (v) above can no longer be invoked to request the setting aside of the award if the party was aware of them during the arbitration proceedings, but failed to raise them at that point. The grounds mentioned under (vii), (viii) and (ix) are the only ones that can be raised ex officio by the court. The claim for setting aside the award must be filed no later than three months after the date of notice of the arbitral award (except with respect to positive arbitral awards on jurisdiction that can only be set aside together with the final award). The new rules allow the court handling the annulment claim to adjourn the dispute and invite the arbitrators to take measures to remedy the irregularity that founds the annulment claim. Pursuant to the new rules, the decision that allows or rejects the claim for annulment of the award cannot be appealed. If all parties are non-Belgian, they can waive their right to apply for setting aside the award, before or after the dispute arose. This waiver must expressly refer to setting aside proceedings; a general waiver to invoke ‘any legal recourse’ will not be sufficient in that respect. Belgian parties cannot waive this right (a waiver would be deemed null and void). A party may also seek to challenge the enforcement of the arbitral award (see question 32). Since January 2017, the party that lodges a recourse against the exequatur order of an arbitral award and wants to annul the same award has to introduce concomitantly and in the same procedure an annulment application, provided that the time limit to file an annulment application has not expired. With that reform, the legislator gave jurisdiction to the same court to hear enforcement proceedings of an arbitral award issued in Belgium and concurrent setting aside proceedings brought against the same award. Pursuant to the new rules, an application for leave to enforce an arbitral award, whether foreign or domestic, must be submitted to the court of first instance of the place where the party against whom enforcement is sought has its domicile or residence in Belgium, or, in the absence of such domicile or residence, the place where the applicant wishes to enforce the award. This application is ex parte. The party against whom enforcement is sought has, subject to exception, no right to be heard at this stage of the procedure. The party seeking to enforce the award must elect domicile in the court’s district and file with its application the following documents: the authenticated original arbitral award or a certified copy thereof; the arbitration agreement or a certified copy thereof; and a certified translation of both the award and agreement into the language of the court proceedings. As far as domestic awards are concerned, enforcement of the award will be denied if the court finds that either the award or its enforcement would be contrary to public policy, if the dispute was not arbitrable or, in respect of foreign awards that do not fall under the scope of the New York Convention of 10 June 1958, if one of the other grounds for refusal exists. To a large extent, the new rules on arbitration match the grounds for annulment and the grounds for non-recognition for both domestic and foreign awards. As regards foreign awards, the application will be based, in most cases, on the 1958 New York Convention, or on one of the bilateral conventions mentioned below. If the state where the arbitral award was rendered is not a party to any treaty or convention, the court will apply the rules set out in the Belgian Judicial Code. Belgium has adopted the 1958 New York Convention subject to reciprocity, and applies the convention both to commercial and civil disputes. Belgium has also signed five bilateral conventions regarding the recognition and enforcement of foreign arbitral awards with Austria, France, Germany, the Netherlands and Switzerland. The bilateral conventions as well as the 1958 New York Convention all provide that the party seeking to enforce the award is allowed to choose the legal regime that seems the most favourable towards recognition and enforcement. If enforcement is allowed, the party against whom enforcement is sought can challenge the enforcement order within one month as from the date of service of the order. Although this procedure does not by itself stay the enforcement of the award, the party against whom enforcement is sought may request a court of first instance (for domestic awards) or the judge of the attachments in a court of first instance (for foreign awards) to order a temporary stay of the enforcement if he or she proves that there is a strong prima facie chance that the enforcement order will be reversed. The party against whom enforcement is sought may also escrow the amount that he or she has been ordered to pay, so as to avoid the actual remittance to the party seeking to enforce the award. If enforcement is denied, the claimant may only lodge an appeal against this decision before the Belgian Supreme Court. A challenge before a court of appeal is not possible. Under Belgian law, the term of limitation to enforce an award is 10 years as from the date of the notification of the award to the parties. Since 13 September 2015, assets belonging to foreign states and international/supranational organisations are immune from attachment pursuant to article 1412quinquies of the Belgian Judicial Code (see question 12). The Act of 23 August 2015 introducing Article 1412quinquies in the Belgian Judicial Code was partially annulled by the Belgian Constitutional Court on 27 April 2017. Unless otherwise agreed, the fees and expenses of the arbitrators, the administrative fees of the institution (if any) and the parties’ reasonable fees and costs (including legal costs and expert costs) shall be allocated between the parties by the arbitral tribunal in the final award. To prevent or resolve a dispute, the parties may turn to several types of ADR, such as third-party decision, conciliation, mediation or arbitration, and several mixed types of ADR, such as the ombudsman organised within the auspices of certain autonomous public undertakings, such as the postal service and the railway service, and the mini-trial organised by CEPANI. There are no legal formalities with regard to the first two types of ADR. Conciliation may be voluntary or mandatory (see question 35). A specific chapter of the Belgian Judicial Code is dedicated to mediation. The type of ADR chosen will mostly depend on the nature of the dispute. While mediation is commonly used in family disputes, other ADR methods are often used in commercial disputes. A Belgian Act regarding ADR in order to settle consumer disputes was passed on 4 April 2014 as a result of the enforcement of two European directives (2013/11/EU and 2009/22/EC). The Act was introduced in Book XVI of the Belgian Code of Economic Law and came into force on 1 June 2015 and has been amended by the Law of 26 October 2015. Certain issues require a conciliation attempt before the introduction of court proceedings; for example, with regard to labour law, (land) lease and the protection of the environment. When the parties have agreed to ADR, the courts will give effect to their agreement. At the request of either party (but not ex officio), the courts will compel the parties to exhaust the ADR method on which they had agreed before allowing the parties to proceed before the courts. ADR clauses are in principle without prejudice to either party’s right to seek interim measures (see question 12). the use of documents drafted in a language other than the language of the proceedings. Pursuant to a reform approved in 2012, the courts of first instance, the courts of the enterprise, the labour and police courts in Brussels were split into French-speaking courts and Dutch-speaking courts. The use of language in arbitration proceedings, on the other hand, is not regulated. Moreover, since 1 April 2014, the number of districts has been reduced from 27 to 12 for the courts of first instance (with the splitting in two of the district of Brussels), and from 27 to nine for the courts of the enterprise (with the splitting in two of the district of Brussels). At the end of 2017, the Belgian government approved a preliminary Act for the creation of the Brussels International Business Court (BIBC). Pursuant to that preliminary Act, the BIBC is a special state court dealing with the settlement of international business disputes. The proceedings will be conducted in English. The decisions of the BIBC will not be subject to appeal but challengeable before the Supreme Court on points of law. The BIBC will be composed of a professional judge and two lay judges (lawyers, university professors, etc). The composition of the chambers of the BIBC will vary depending on the nature of the dispute. The rules of procedure are likely to be based on the UNCITRAL Model Law. As from substantive law, the BIBC will apply the law chosen by the parties in their agreement. 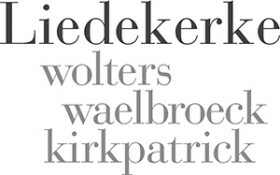 Liedekerke is the largest independent Belgian law firm today, with over 130 lawyers in Brussels and in its office in London.